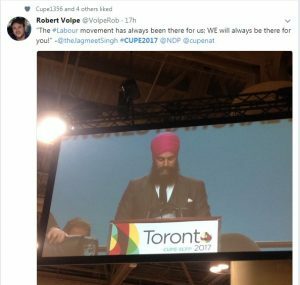 It’s the fifth and final day of the convention and after a week of exhausting debate and emotional upheavals everyone was waiting for the special guest speaker Jagmeet Singh, the new leader of the NDP. 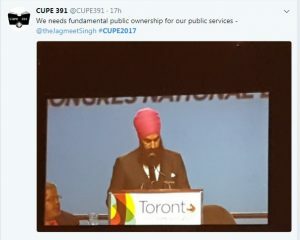 I must say, he was well worth the wait and did not disappoint, speaking strongly against P3’s, precarious work (talking to his own experiences of precarity and being the sole income earner in his family) and how the NDP supports labour and the labour movement. 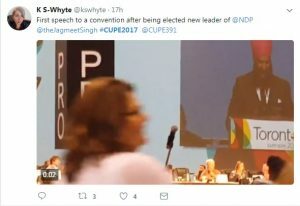 We were all very honoured to hear that we were his first speech to a convention since winning the leadership of the NDP. From there we moved on to resolutions, but being the last day we quickly lost quorum . Before we lost quorum though, there were some heated conversations at the mic. The resolution conversation started with talks on governance, or a look at the makeup of the National Executive Board and while I am glad it passed, it was still disappointing that the diversity seats were not added. That lead the resolutions committee back to the resolution on the trial process where it became quickly clear that there was nothing the resolutions committee could do. Debate on this went on, as the trial process seems to be quite a contentious part of the constitution and many locals and people have been hurt by it. Hopefully this can be fixed at the next national convention (although that is little consolation to those who have been so grievously hurt by it and are continuing to be hurt by it. And with that debate quorum was lost and convention was over. It was a pleasure, an honour and a privilege to be able to represent my local and my membership at convention.